Ekonnect’s initiative of Not Just Walk in the Park: A walk-around fun and educational exercise that involved children and adults identifying trees in a park with waste segregation and composting activity incorporated in an interesting manner. Decreasing green cover in Mumbai city with its resultant negative impacts including: climate change as evidenced through increasingly hotter summers, loss of carbon sequestration potential, decreasing ground water levels, loss of rain water through run-off, deficit of local biodiversity, loss of derived sense of comfort and pleasure from green areas and related loss of community areas for recreation. 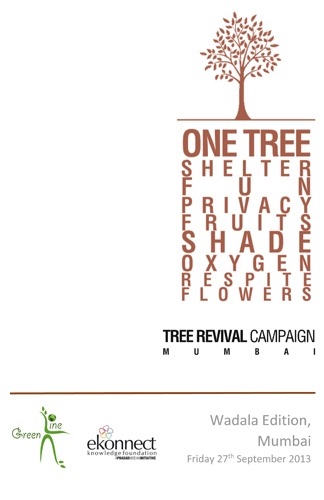 Take this activity out of the park and into the Mumbai city neighbourhood to emphasize the importance of trees, encourage citizen ownership and responsibility to take action as protectors of their own natural environment, and the urgent need to protect and grow trees in an urban setting. GreenLine, a environmental trust, led the way for the Tree Revival Campaign, bringing in the school children, teachers, experts, and hosting the events at the venues. Visit GreenLine online HERE. 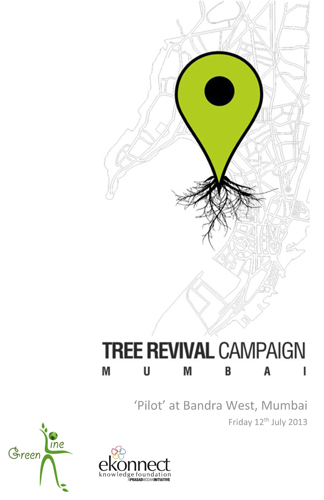 Download and read the reports for Tree Revival Campaign editions at Bandra and Wadala.